Log Period and Areas of Service: 1947-65, Greenland, Antarctica, Arctic, attempted North Polar circumnavigation. 20 March 1947 – Shakedown cruise on east coast and training cruise to Greenland. 1 November 1947 – Sailed to Samoa; with Burton Island (AG-88) sailed south into the Ross Sea. Returned to Boston. 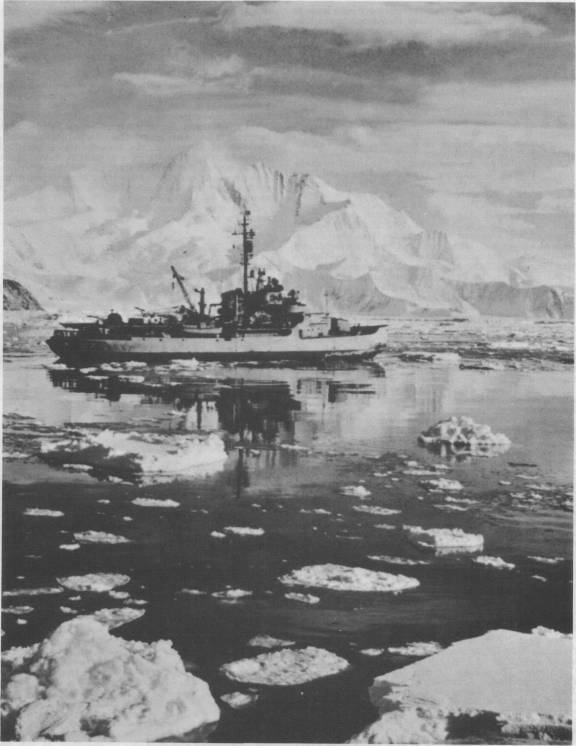 31 March 1948 – Spent summer in Canadian and Greenland waters. 24 January 1949 – Sailed north to determine how much an icebreaker would be limited by Arctic storms and extreme subzero conditions. 1949 to 1952 – Took part in Operation BLUEJAY, constructing radar stations in the far north. 6 August 1950 – Set a record for northern penetration by reaching latitude 82° North while conducting oceanographic surveys. 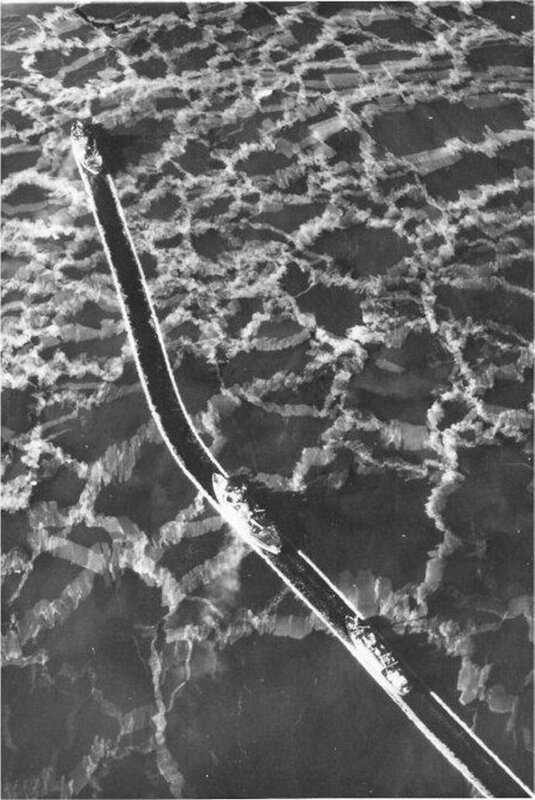 1955-1956 – Penetrated unexplored areas in the Antarctic near Cape Hallett. 1956-1957 – Assigned to Arctic missions. December 1958 – Departed for Operation DEEPFREEZE IV in the Antarctic. 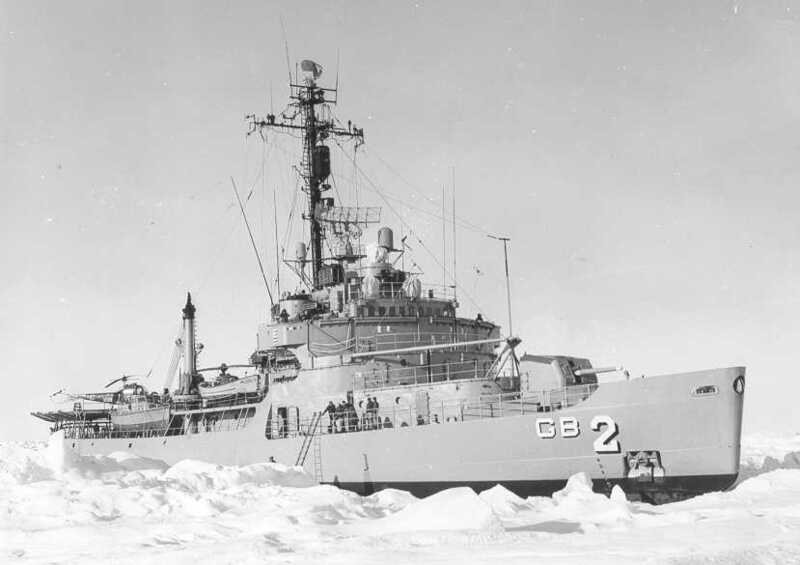 1960-1961 – Took part in Operation DEEPFREEZE 61 in the Antarctic. 1962-1963 – Took part in Operation DEEPFREEZE 63 in the Antarctic. 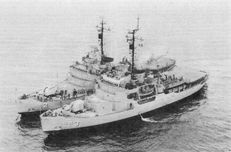 15 June 1964 – Departed Boston for military resupply operations in the Arctic. 10 December 1964 – Took part in Operation DEEPFREEZE 65, constructing new Palmer Station for Marine Biological Studies on Anvers Island. 6 April 1965 – Sailed on a polar rescue mission. 20 October 1965 – Became USCGC Edisto when decommissioned by the Navy; transferred, and immediately commissioned by the Coast Guard. At Bethlehem Steel Shipyard for repairs and alterations; given a flight deck with a telescopic hangar to house two helicopters. Served in the Atlantic Arctic and Antarctica. "USS Edisto clears a path through the ice-covered Antarctic waters, for USCGC Northwind (center) and the British Scientific Research Ship RRS John Biscoe II. The Edisto and Northwind were sent to free John Biscoe which became trapped while carrying supplies and rotation personnel to the British scientific research bases in the Antarctic. At one point the Northwind also became trapped in the ice."